This has been so much fun! Thank you all for playing. I actually have TWO winners…I’m feeling generous. Their useless gifts will be on the way next week. BUT, I’m not revealing the answer because I wrote more “hints.” Here’s the last two. Here’s hint #4. If you’ve been in this room, you’ll know the city I visited. It’s New York City and clue #4 is Ellis Island! Hope you had a great trip! I Love NY! I don’t get there too much, but there is so much to do and see that I am always reeling. I always walk around with my head up in the air, like a true tourist! Ellis Island, of course. Was just there for the first time exactly a year ago, despite being born and raised in the New York metropolitan area. I see you are in New York City. I agree with sitting next to a window if you are flying in. It is wonderful. Once I flew into the city when it was completely covered with fog with just the very tips of the highest parts of the skyscrapers showing–amazing! Another time we flew in following the river. I got to look directly down on the Statue of Liberty and Ellis Island. Somehow flying out is not as exciting–I am just sad to be leaving. New York City! 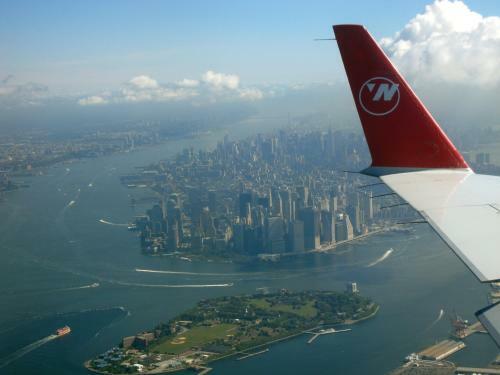 Number 4 is Ellis Island and #5 is the tail of Northwest Air. Looks like you are leaving NYC. Of course, it’s New York City, and flying into LaGuardia on my first trip there, we flew over the Statue of Liberty just as a submarine was surfacing!! What a wonderful sight!! Well, the food didn’t give it away to me. Neither did the empty hall – although at least I knew it was somewhere in the USA. But the skyline photo did it. I would recognize Manhattan in a minute! That’s NY city!! I hope you enjoyed your time there. Lots to see and lots to do! And the City Quilter and there’s a great button shop. Wow! You could’ve came for a visit! Darn it… Ami was sooo close but yet so far away! I was probably on that little ferry boat (small yellow blob in the water) while you were passing overhead. Did you get to the City Quilter? One of my favorite stash building stores! NYC! Isn’t Ellis Island wonderful? I could “hear” all the voices of immigrants in the Great Room. The steep stairs up to the room add to the “greatness” of the room. I went on a real cold day on purpose so my friends and I could feel like our ancestors when they came to the Island. 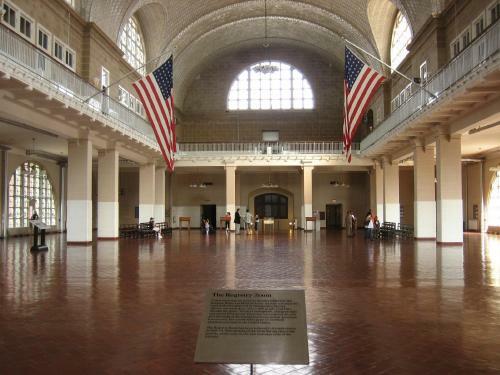 The Reception Hall at the Ellis Island NY immigration centre – now a museum and national historic monument. Too bad it took me so long to get here: I could have been the new proud owner of a useless pressie! (That’s Britspeak for present). ellis island registry room.NY-hope you had fun!